Once the report of domestic violence is received, the police will be dispatched. Even if another party or the same party calls back to say it was a mistake or that nothing happened, the call will be followed up by the police. When they arrive, the police will separate people and begin their investigation. In our experience, it’s very unusual for them to question anyone other than the person who they think is the “victim” of the domestic violence. There is, in Ontario, a zero tolerance policy regarding domestic assault. If an allegation of domestic assault has been made, police must lay a charge and Crown Prosecutors must prosecute the charge. Once the charge is laid and the arrest is made, in the vast majority of domestic assault cases, the police will not exercise their discretion to release the person without a bail hearing. Normally, the police determine whether this is a kind of offence that requires that a person be held in custody for a bail hearing. For most simple criminal offenses and for most first offenders, police officers will typically either release a person directly from the scene after having given them effectively a summons to come to court, or they will bring them back to the police station, request that they sign some additional documents known as an undertaking with some fairly simplistic conditions on them and then release that person again later that evening. However, the domestic assault system includes a policy that removes almost all discretion from the arresting police officers and indicates that a person charged with a domestic violence offense should always be held for a bail hearing. The effective consequence is that, at the very least, the accused is going to be spending one night in jail. Unless this incident occurs very early in the morning and by some miracle the accused is brought to court on time that day, he is most likely going to be spending one night in jail. He will have a limited opportunity to call his lawyer and probably no opportunity to call family members or a friend. 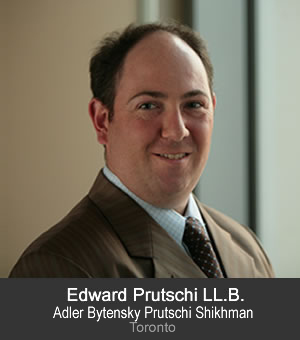 If you, or someone you care about, is dealing with criminal law issues in the Toronto,Ontario Region, contact Adler Bytensky Prutschi Shikhman for a consultation. This information is taken from an interview from February 29, 2008 with Ed Prutschi, Criminal Lawyer with Adler Bytensky Prutschi Shikhman, Toronto Criminal Lawyers. The article is provided as an information service only and should not be used as legal advice. Laws vary by jurisdiction so please consult with an appropriate legal professional if you are looking for help with a specific situation.